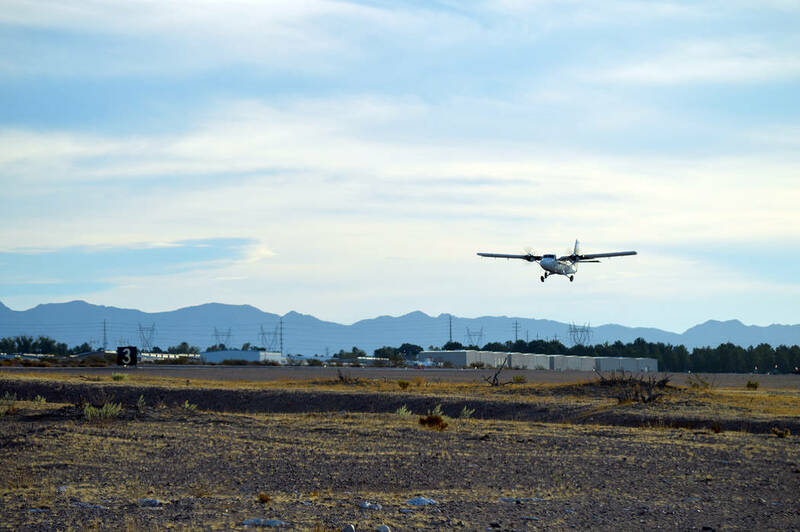 The Boulder City Municipal Airport could have a working control tower in approximately four years if the City Council approves its proposed five-year capital improvement plan, which includes funding for design of a tower in the 2019-2020 fiscal year. Celia Shortt Goodyear/Boulder City Review A plane takes off from a runway at the Boulder City Municipal Airport. The airport is moving forward with installing an airport control tower to increase safety at the facility. In April, the airport was approved to participate in the Federal Aviation Administration’s control tower program, meaning it could install an air traffic control tower. Airport Manager Jennifer Lopez said she hopes have it in service by August 2022, as funding for installation of a tower is in the city’s proposed capital improvement budget for 2020 and 2021. Lopez said the tower was added to the proposed capital improvement budget for several reasons, including airport safety by monitoring arrivals and takeoffs. Funding was also an issue because until recently the airport did not have enough to finish the estimated $4.95 million project. Lopez said the FAA reauthorization bill signed Oct. 5 by President Donald Trump removed a funding cap for control towers. Lopez said current estimates have the airport providing $309,000 and the FAA providing $4.635 million to build the air traffic control tower. The city would also have to pay for its maintenance. At several recent Airport Advisory Committee meetings, operator Bob Fahnestock expressed concerns about safety at the airport and said he thinks it should have an air traffic control tower. Additionally, Lopez said the airport has a specific timeline to complete the tower, or it will have to reapply to the FAA program. Boulder City Communications Manager Lisa LaPlante said she was not sure when this item would come before the council. Contact reporter Celia Shortt Goodyear at cgoodyear@bouldercityreview.com or at 702-586-9401. Follow her on Twitter @csgoodyear.